When thinking about mental strength, we often think of athletes and Navy Seals toughness. Mental strength is a measure of individual resilience and confidence that may predict success in sports, education and the workplace. In fact, for athletes to succeed, they need both mental and physical strength. The framework used to improve these two is identical: Practicing good habits and giving up bad habits. The secret to performing better in sports lies in both our mental and physical capacity. That said, most of us might think that the physical preparation matters more. In fact, the physical training roughly counts for not more than 20%, 30% at tops. The rest resides in mental preparation. Take for example surfers. I have seen young surfers who are very fit with toned muscles and good cardio condition, but as soon as the waves get over 6-8ft, they don’t paddle out. I have also seen older surfers waxing their surfboard ready to paddle out for big surf. They are not necessarily fit or physically prepared for the massive lip of the wave or the countless minutes of paddling to the lineup. However, they are the only ones who enjoy empty lineups riding giant waves. So what’s the difference between the young and the old? Mental strength. Experienced surfers spend time developing their mindset. Just like any other athletes, surfers who would like to perform better dedicate a significant amount of time on gaining focus, resilience and managing fear. Just like when they want to develop a muscle, they need to spend hours working on it, being consistent, adding weight and challenging themselves, nourishing their body, sticking to a program and having discipline. The mind works the same way, the only differences are the methods and the techniques used. First of all, you need to be specific and able to measure what level of performance you are at right now and what level you want to reach.
. What stops me from reaching the next level? These two questions will reveal to you what you need to do in order to reach your next level of performance. 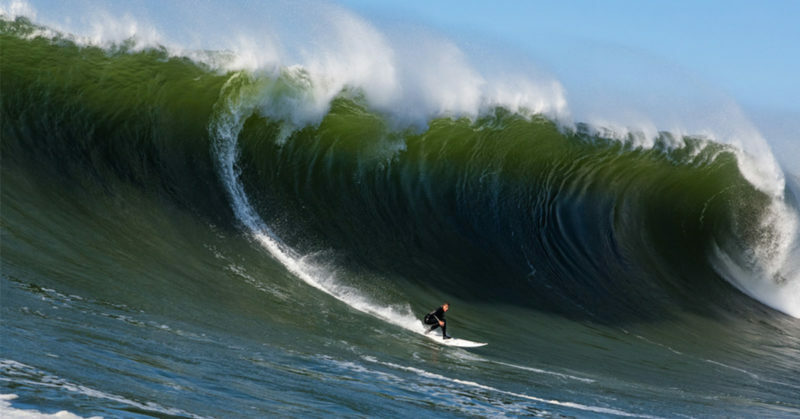 For example, if you are a seven because you can’t surf bigger waves, reaching the next level could mean being able to surf double overheads, and what stops you from achieving it is controlling your fear and training harder. Decide when you would like to start surfing bigger waves and commit to it. As a coach, I use NLP (Neuro-Linguistic Programming) goal setting techniques to teach my clients how to set goals that engage both the conscious and the unconscious mind in making their goals more achievable. Break down your objectives into milestones and focus on one step at the time. Also called visualisation, when done correctly this technique can be very potent. When you train your mind at doing something over and over, you are preparing yourself to take action, and it becomes easier for you to succeed at what you are planning to achieve. New neuropathways are created while visualising your movements and surf trajectory. It is referred to as Neuroplasticity. When practising visualisation, the frontal lobe of your brain which is in charge of taking action becomes more sensitive to making quick decisions and running complex cognitive behaviour, instead of freezing in front of the signals sent by the amygdala which is the section of the brain that is responsible for detecting fear. You need to hijack your self-talk autopilot. The average person talks to themselves 300 to 1000 words per minute. You need to be aware of what you are saying to yourself while confronting tough situations. When you give up, it’s most likely when your internal dialogue is telling you that it isn’t worth it or that it’s too hard or out of reach. Now imagine if you can say to yourself something that is the total opposite. What actions will you take? Emotions drive all human behaviours, and beliefs drive every emotion. So if you controlled what you think you could generate new emotions which would create different actions and which in return would impact your results. Consciously repeat to yourself over and over sentences and mantras that are empowering, and that will help you override your negative self-talk. When in fear or panic situations your breathing is crucial to your survival. Whether you are a surfer or a runner, you need to stay focused and breathe consciously and consistently. Learn pranayama breathing techniques to calm your mind and hold your breath longer. Fear only exists in the future. By being present, you control fear. One great way to train yourself to be in the present is to use meditation and mindfulness techniques. Try to focus on each one of your senses for 10 minutes. Shift your awareness from kinaesthetic senses to auditory, visual, and olfactive senses. Use apps like headspace.com to guide you through these processes. In coaching, I use NLP techniques to overcome anxiety and fear. How you do anything is how you do everything, and surfing is just another metaphor for life. Sometimes the surf is up, sometimes down; you need to see each obstacle as a way to improve and turn them into opportunities and never give up. Discipline, toughness, stubbornness and perseverance all have relevance to everything we do. These steps can apply to anything in life.